After spending some time thinking about what could be a good niche for you to blog about to make profit, you’ve got a short list. You like the look of them – you’ve got at least some interest in them, if not a passion (not necessary but can help with the writing and knowledge). Before you get too carried away with it and get busy writing it’s a good idea to see if you can make money from it to make it profitable. 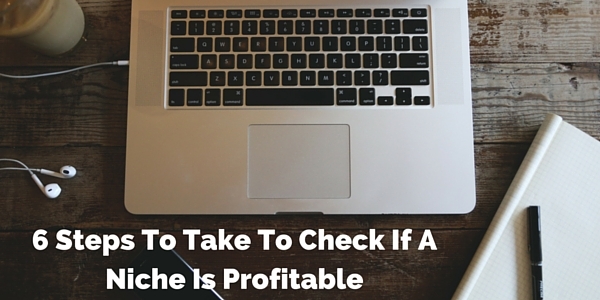 There is never guarantee that you’ll be or the niche is profitable but here are 6 ways to check to improve your chances. First up is looking at how much competition there is in the niche. If there isn’t any then it might not be such a good idea for you to go into – it’s unlikely that you’ve found an untapped niche in this day and age especially if there is money to be made into it. However, it’s not impossible. I guess someone must have known about drones before they became popular! It is a good sign if there is competition that there is. You can find blogs by typing the niche into Google or you can try Alltop.com for further blogs if you can’t find any. Take a look at the blogs and websites that are there. Check out how good they and authoritative they are. This can give you an indication of how tough it might be for you to make an impact with your blog. As well as looking at the content have a look at how those blogs are monetizing their content. Are there popular products for the niche. The best way to find these is using large market places. For physical products Amazon is a great place to find if there are any being sold. You might not find any specific products for your niche depending on how specific you’ve gone on selecting but there should be some related products that may appeal to your audience as well as a broader one. If your niche is muscle gain for men in their 50s – a product that helps all people put on muscle = like barbells and plates would fit. As to popularity you can look at how many reviews the products are getting. Clickbank is a great place for checking to see if there is information products related to your niche – again related products that can help people in your niche meet their wants is fine. You can also check Offer Vault to get an idea of different products and programs available for sale. You’re really looking here to see that there are plenty of products and they are selling. This is another way to find out if people are interested and/or passionate about your niche. Again it may need to go broad but it is important to be able to see people in them being interested in the specific niche. To find forums use Google typing in your niche followed by forum or findaforum.net Take a look at the forums to see how active they are and in particular about your niche if it is on a broader niche. You want to see good interaction with recent threads. Facebook is another good place to see if there are people who are passionate about a topic. There will be fan pages and groups and interests that you can find by typing your niche in to the facebook search to see how much interest there is – by seeing if there are plenty of fan pages and groups. You can do something similar on twtter by searching for your niche and taking a look at the different accounts and see if they are active. Are there people online searching for the niche. You can check that out by using the Google keyword planner. Here you are looking to see that there is a good number of searches for the niche and related. You want a good number of searches of say around 10,000 or more for main niche keyword (or it could be less if following the Extreme Review method which use a more focused product niche keyword). This is a quick check to make sure that the search volume and interest for niche isn’t trending downwards over time – which can indicate it is a niche that is dying out – like the interest in the TV program Lost once it came to an end – it’s now running at 4% interest as it was at its peak. Unlike drones which is trending upwards – it did peak in December 2015 for Christmas probably and is down now but looks like it’s on the increase. This is a good way to determine if there is commercial intent in the niche – the keyword anyway. If you use the keyword planner you can get an indication of what people are prepared to pay for the keyword and related keywords – if people are paying for ads it’s an indication that there is money to be paid in the niche. Now you’ve done your research on each of the niches, you’ve come to step where you evaluate the results to decide on which ones seem to have the most potential for profitability by comparing them. It is a matter and looking at each of them to see which ones have good search volumes, popular products and there are large groups of people that are passionate about the product. Those that do have the best chance of being profitable. I find researching and evaluating niches one of the most challenging and frustrating steps. Taking the time here can help to save you time in the future, so it is well worth putting the work in now rather than suffer the pain of disappointment later on when you discover there isn’t a way to successfully monetize your blog profitably. P.S. If you want further guidance on blogging and affiliate marketing then the course Home Blogging and Affiliate Marketing For Beginners by Pajama Affiliates (See review here) is a good course to get you started taking you step by step from choosing a niche, how to monetize it, setting up a blog to writing and publishing your content.